I made a decision today to stop faffing about and get right back in to the 1940s saddle.. (Day in day out I’ll be living on wartime rations with the occasional deviation when its not practically possible or someone cooks me a meal etc)…partly because after several weeks without weighing scales I bought some accurate digital ones the other day and my weight has shot back up to 20st 10 lbs (according to the new scales- jeeez I had a little cry) and secondly, on Saturday I spent a day baking several iconic wartime recipes for a photo shoot at my new house yesterday. I won’t say too much to jinx it but maybe, just maybe, the food will appear in a very well known British newspaper in the near future. I’m very, very happy about this as it promotes simple, cheap, nutritious food and I am passionate about this as you know. My heart goes out to people who struggle financially and find it hard to feed their kids. If anything I cook on here helps a few people have a go at making a few changes and saving a few pennies, it would make me happy. And there is so much happiness in my life right now. I’m still seeing the lovely, beardy, sparkly eyed man. I’ve waited a long time to let my heart open up fully to someone again. I’ve hit the jackpot culinary wise too as this man can cook. 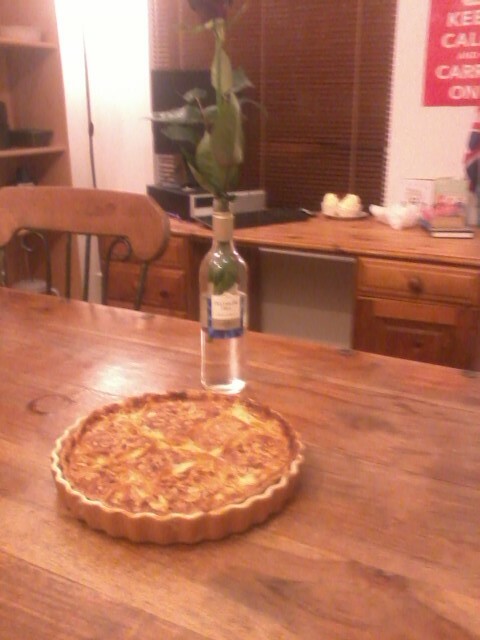 He brought me a giant Bakewell tart he had baked, and a red rose to my house the other night and we made vegetable curry together. Glad everything is going so well now Carolyn, you deserve some happiness after all your trials…. and a new man is always a good incentive to get you back on track….sure he will chase you to give you a bit more exercise! take care lovely, we are all here cheering you on! I weighed in today as well Carolyn and have some to loose. Good luck, you rock. I am glad things are going well for you! glad you going to get back on track i hope you do well in your quest and good luck in your new relationship! Good luck with your plans. Lovely to hear of the romance, too. Gives me hope for the future. 🙂 We’re almost the same weight, just a few pounds difference and I’m trying very hard to get motivated again so I’ll be following along your journey with interest and encouragement every step of the way. Best wishes with weight loss Carolyn. I have a couple of stones to go (at least!) and thinking of going vegan, so I shall look forward to your menus and other info about how you are getting on. I shall find it all very inspiring! Welcome back Carolyn, so glad to hear things are going well for you. Congrats on the new relationship too. Could you post the vinegar cake recipe…or did you do that already? I’m still following the rationing diet but have to tweek it a bit. My doctor recommended eating more green vegetables and less potato and carrots. My triglycerides(?) need to be lowered.